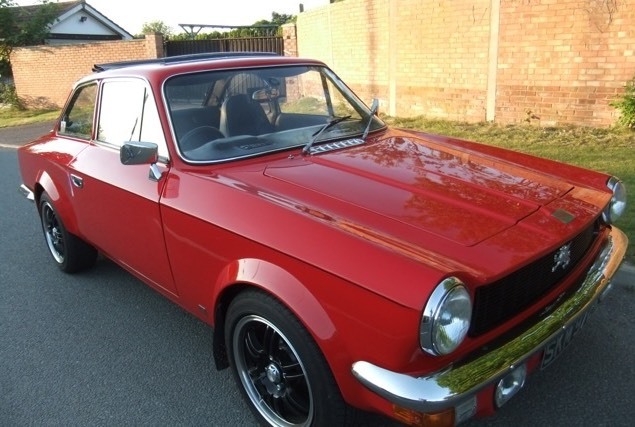 Gilbern Invader Mk111 1974 finished in red with black leather upholstery, four speed manual with overdrive on 3rd and 4th. Electronic Power Steering, Servo Assisted All Round Disc Brakes, Electric Windows, Webasto Sunroof, Discreet Sat Nav, Central Locking, Alloy Wheels. Believed to be the third from last built out of a total production of only 207, this stunning car has been meticulously kept and maintained all its life and had only covered a genuine 51,000 miles from new and was in good useable condition when the last owner purchased the car. This owner carried out a painstaking total restoration, works including the Ford 3 litre V6 engine completely rebuilt with Unleaded Heads, Complete body strip and Repaint, Complete Retrim, New Stainless Steel Exhaust, Fitment of power steering, New Disc Brakes, Detailed Engine Bay plus much more, to the most exacting standards. Supplied with a comprehensive history file going back to 1976 including invoices for servicing and restoration and Original Drivers Handbook. This very rare car has now covered a genuine 53,000 miles from new and is in Show condition and drives better than the day it left the factory.